The feel of this really reminds me of Metroid with a good amount of modern-day features - especially the physics! Awesome game, very well laid and entertaining, amazing 16-bit look also. This is really good! It's a shame it hasn't gotten more attention so far. If Jarvis has reached 10+ pages without a demo then this should certainly be getting more comments. I really enjoyed exploring this world so far and it feels neither too easy nor too difficult. Some quick feedback, good points first! - I like the atmosphere and dialog. - Detecting the Xbox 360 joypad and referencing it in the dialog was a nice touch! - It's nice to be able to view a whole room by using the little robot buddy. - Climbing walls is especially good and feels intuitive. - Even small enemies feel like a threat and I was surprised once or twice by falling wall crawlers! - The large red enemy AI is good and feels formidable. - The silhouette sections are nice and hide the enemies well. I really enjoyed these parts. - I haven't seen any major bugs with the player or enemy movement. - Player should shoot on pressing the button, not on release. Using a charge shot will fire one regular shot before beginning to charge. - Sometimes he lets go while I'm climbing walls, even if I don't adjust the angle of the stick or release the jump button. - Moving blocks with physics is sometimes tricky. - Many of the rooms feel similar. Super Metroid had some vertically (only) or horizontally scrolling rooms so I'd suggest something like that. They act as landmarks in a way. - I'm not sure I agree with having fall damage and so many high drops right away. - The auto-roll after a high(ish) jump sometimes caused me to fall off the small platform I was jumping to. If I could interrupt the roll by jumping again it wouldn't be a problem. - When swimming, you can hold the Action button to stop moving, but I think I'd rather lock my aim while still being able to move. I probably could implement this for the Plasma Beam, but for the later weapons this would be annoying, as you would not want them to fire before accessing the charge . 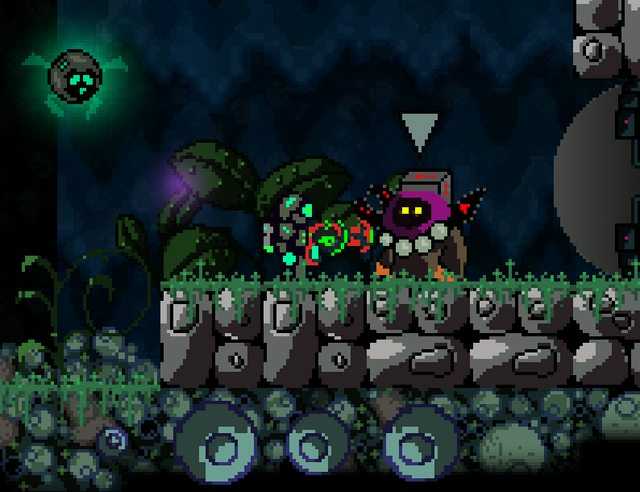 Also there will be more stealth mechanics in the final game which I´m still developing, and not being able to charge before making buzz would spoil it. That´s a bug that concerns me..., I was not able to reproduce it. I have an older gamepad though, which looses connection for a split second now and then, this caused similar problems, as the input transmission to the climbing mechanics is very sensitive. You´re right! It´s actually intended to feel tricky, as telekinesis is not an easy task:P But of course it should not feel annoying. I probably also need to improve the tutorial section on that, I noticed players skipping it too fast and not recognizing the push/pull mechanic which depends on Buddys position relative to the object. You´re absolutely right! There will be different areas which feel more corridor like and I also need to make some extra art in case of special unique backdrop objects that help the player not getting lost! Good point, I will try how it feels! Anyway, while rolling your are still in control of the player and can adjust forward/back. I hadn't got to the end of the alpha when I wrote that feedback, but as it turns out I wasn't far from it. Finding the boss was a little tricky. As for the boss itself, I have nothing but good things to say about it. It's huge, well animated, fair and satisfying to beat. Just really, really good And the section after the boss is really nicely drawn. Moving blocks with physics is sometimes tricky: I noticed players skipping it too fast and not recognizing the push/pull mechanic which depends on Buddys position relative to the object. This is exactly what I couldn't figure out, but I'll go back to it knowing this and perhaps it'll make more sense. At first, I thought that pushing or pulling the block depended on whether it's on the ground or in the air. You know what... I'd like to go back on this. I got used to the fall damage, and you're right - it does force the player to take a more careful approach. I took damage multiple times from falling too far, but I never blamed the game for it because I've always had the opportunity to look around the room first. Most of the time I just used downward shots to break my fall (nice feature, by the way!) I thought that having fall damage in a Metroidvania would turn some players off, but the game is strong enough in other areas that it's not an issue at all, only a matter of adjusting. All the best with finishing the game! If you need any help or further testing let me know here or on twitter. @nim: I'll PM you when I have more to show! In case of the telekinesis mechanic: If buddy is under the objects center it pushes, if it's over the center it pulls!